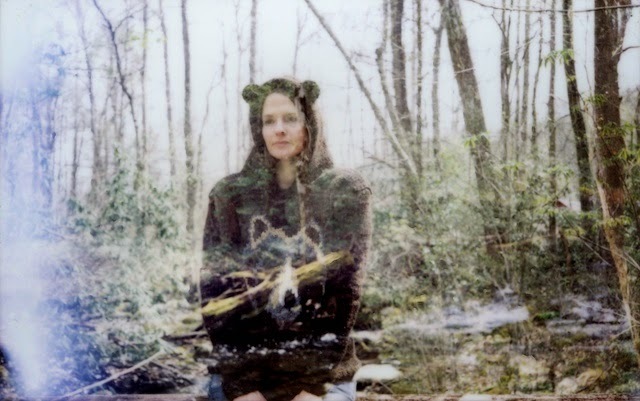 I wanted to meet a bear in the Smoky Mountains. 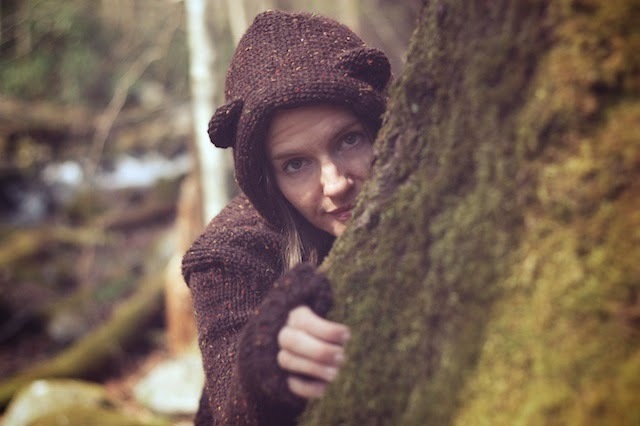 I'd be wearing my Smokey sweater and it would just be a big bear, and we could sense that we were kindred spirits in the forest, exchange nods from a distance, and say "S'up?" as we each went our own way. Yeah, once I get an idea like that in my head there's no exorcising it unless I just make it happen. 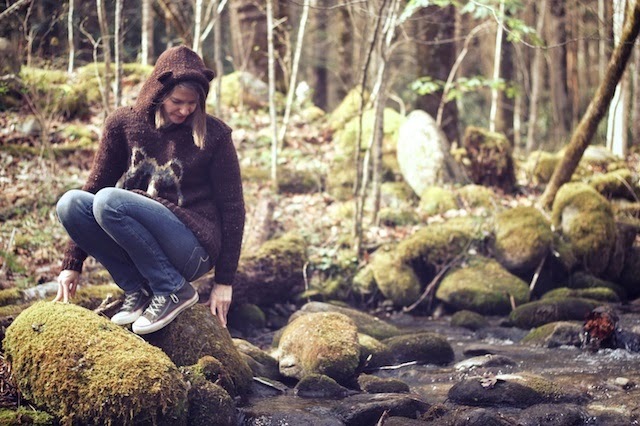 It was just a personal challenge for myself: to make an Oh My Bear sweater, by Stephanie Dosen of Tiny Owl Knits, while in the Smoky mountains. Isn't Stephanie the most most creative person? I love her Flickr stream. Great as this project was, I almost didn't make it. 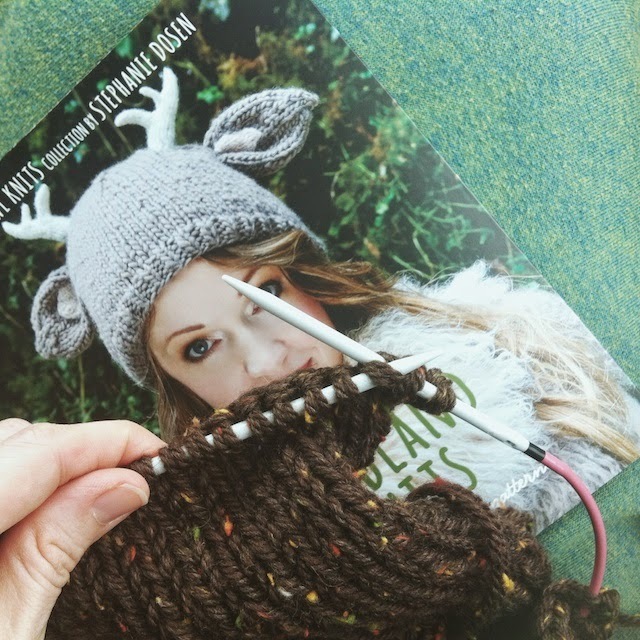 I already have yarn for several (ahem, fifty), intricate, winter sweaters in my closet. I also didn't really need a giant bear face in my wardrobe.... unless I did. The thing that finally pushed me into it was my husband asking me what else he could do for me on my birthday as we drove to a restaurant to eat. I couldn't think of anything practical that I needed. 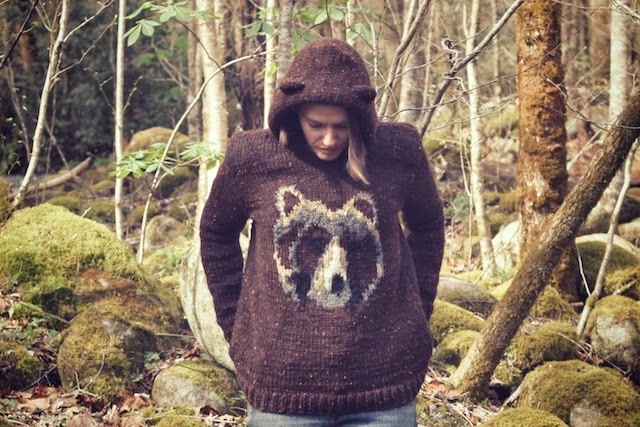 After some prodding from him, I finally admitted I would like a ton of brown tweed yarn to make a giant bear hoodie. Husbands, be careful what you ask for. Before we even pulled into the restaurant that day, we had raided Joann's, Michael's, and Hobby Lobby for all of their Patons Classic Tweed. Since each store refuses to carry a half a sweater's worth of any type of yarn, I ordered a few more. I had like eight skeins of the stuff, plus a bunch of leftovers in 4 other colors for the intarsia facial features sitting in my closet, waiting to become Smokey. Only, the days ticked by and before I knew it, it was time to leave for the Smokies. So, I tossed the pattern book and bag after bag of yarn onto the floorboard of the truck, and my road trip project was decided. I've never tried intarsia on purpose, so this was quite an undertaking. I also didn't know to bring, or make, bobbins, so it was insane. But what else are you going to do when driving from Texas to Tennessee except read, listen to music, and talk? These are all things I can do while constantly untangling fifty little yarn strings. In this way the front and a portion of the back were knit on the first day of driving. Bulky has it's advantages. Deciding where to do fair isle and where to do intarsia was kind of like choosing the order of paint colors for a paint-by-numbers. Had I used bobbins, it would have been completely relaxing and fun. As it was, I still enjoyed the process, but it looked all messy. Being my first time to do intasia or duplicate stitch, I had a sad, tumorous-looking bear head staring up at me the whole way. I doubted my abilities, but decided to wait until we got to the hotel to start over. Thank goodness for steam blocking and spot blocking. They are my new favorite things! I laid a damp towel over Smokey and used the hotel iron on the wool setting to press him. Voila! He was suddenly smooth and fierce. I did the same thing in our one night at a hotel on the way home with the sleeves. They were knit in the camper or by the fire at night and they seemed a little too thin for the armholes. I seamed them together anyway so I could take these photos, but after steam blocking them, they stretched in width perfectly. Did I mention seaming? This was the only truly frustrating part of this knit. I ran out of yarn and so had to splice several strands together to seam the sides and sleeves. I stayed up late on our second-to-last night to do this. My husband didn't mind because we were both interested in how Broadchurch would end. (Ah, the great outdoors and netflix.) 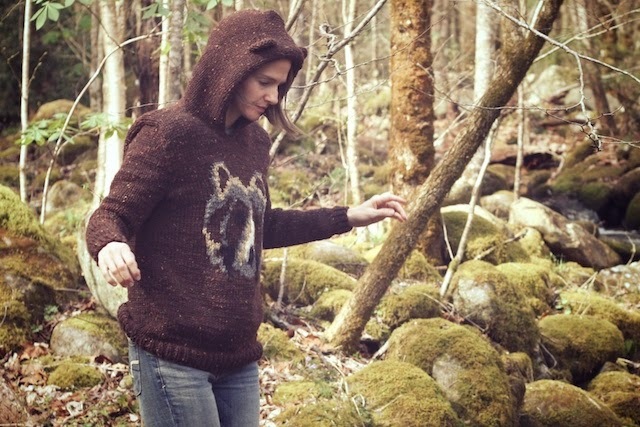 This way, I could wear the sweater while still in the Smoky Mountains the next day. I don't know why this mattered so much to me, but it did. And wear it I did. 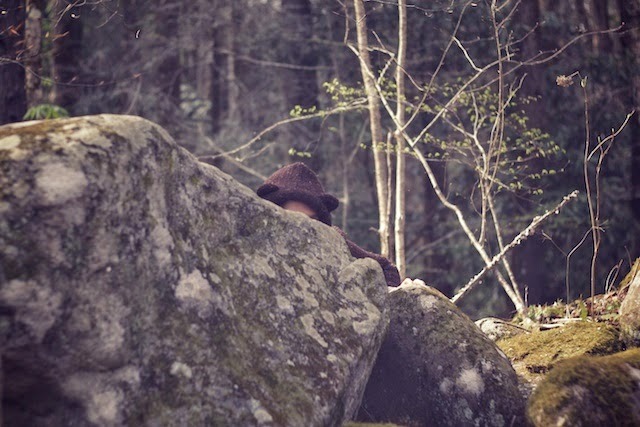 I waited for another bear to show up, even had my ears on, but... nothing. 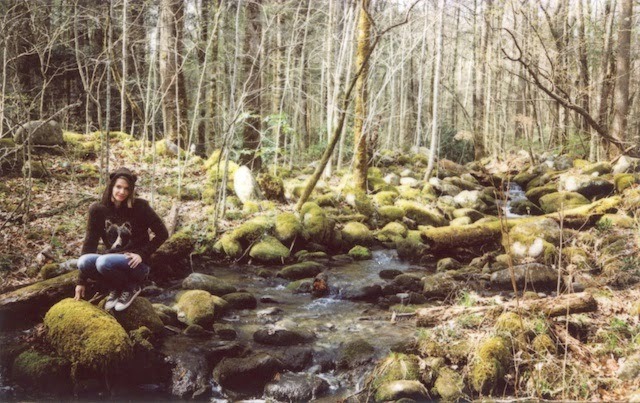 I have met a bear on the Appalachian Trail before. 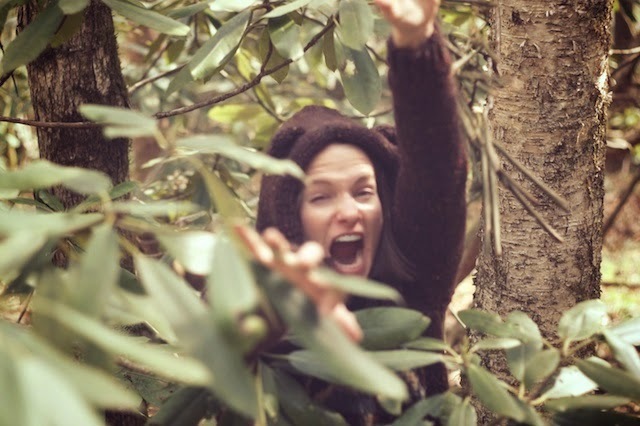 It was a true, wild bear. Not the ones that are bored by all the tourists, like at Yosemite. We had nothing to make noise with except to talk really loud. It was like dumb ad-libbing in a school play. My daughter threatened to kill me if I took a photo. 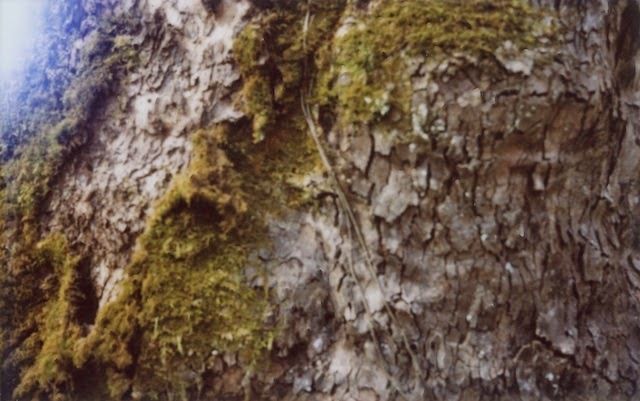 Eventually he became as bored as the bears at Yosemite, shrugged, and climbed up the mountain, weightlessly. It was dark when we got to our car. 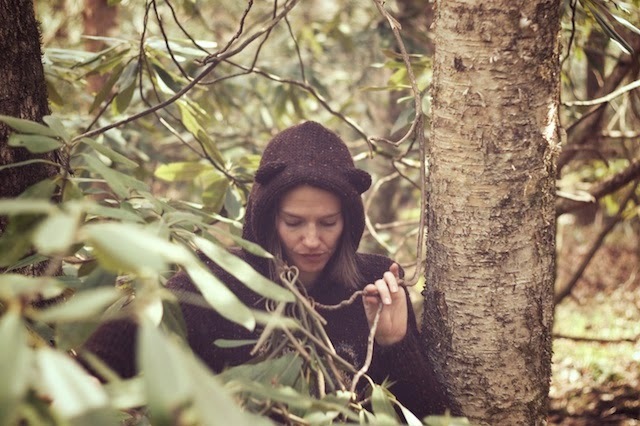 Anyway, I wore the bear hood this time, but no one came out to play. ahh Michelle you do make me laugh! I can just picture this ad-libbing school play type affair happening in the middle of the woods with arms flailing. I wonder what the bear was thinking? 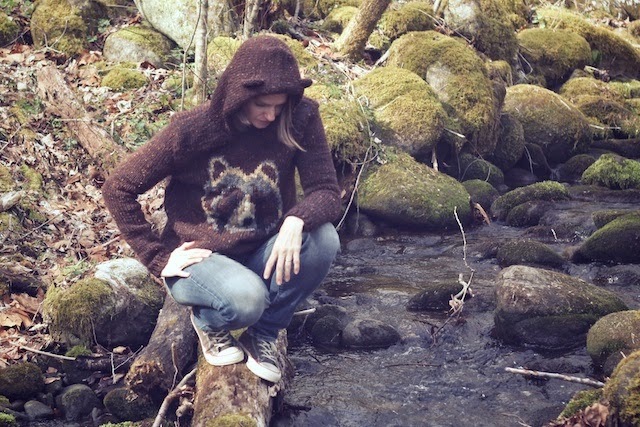 Normally I wouldn't look twice at this sweater but as usual you totally rock it and kind of makes me want a bear sweater.... It would definitely be a hit around here. I hit a baby bear on our road a few years ago. I thought I'd killed him, T was in the backseat yelling, Mum what was it, what did you hit mummy??? I didn't know it then but they are pretty resilient. He shook his head and ran off into the bushes. hilarious. i don't know if i could make and wear a sweater like that but it looks great!!! have fun with it. oh goodness gracious. 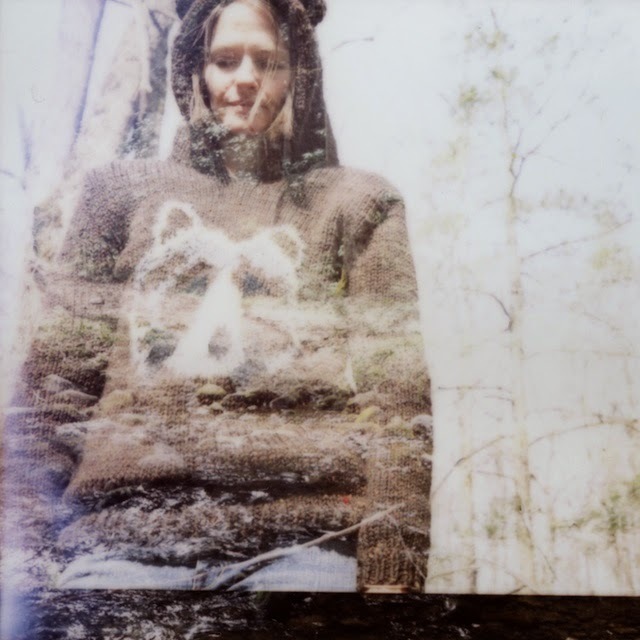 i know why you had to finish this spectacular sweater in haste. 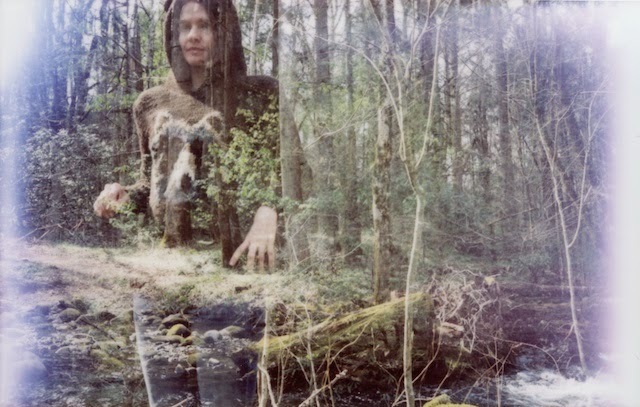 so you could get these spectacular photos in the woods. awesome post michelle, i love it so much. really though? 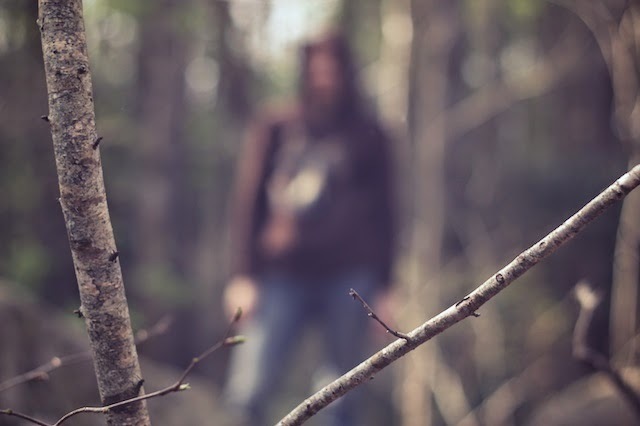 you would want to meet a bear in the wild? oh dear not me, it's the thing that frightens me the most. and bobbins, ick ick, not for me either. i much prefer strands of wool (shortish) and spit splice as you go. enjoy your sweater, you and it are adorable. 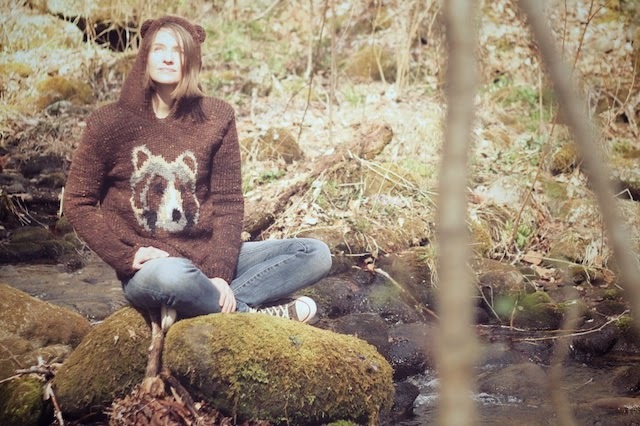 Oh my gosh, you and your bear sweater are adorable! 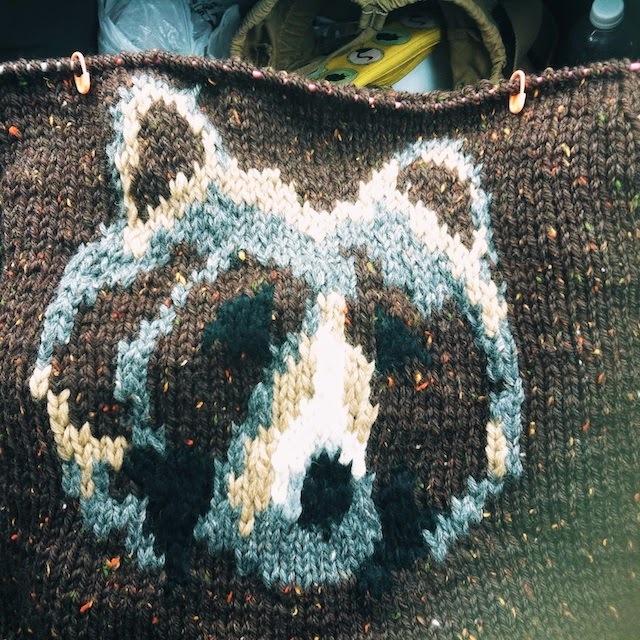 I would have the very same need to finish a bear sweater in a bear-inhabited place. :) Now you're giving me ideas....I have yet to knit a Tiny Owl Knits pattern. I love her music, though. Thanks, Cassy! I think the whimsy of this project made me relaxed about my intarsia efforts. I knew it was supposed to be fun, so I didn't feel like I could go wrong. But, with the help of a Purl Bee tutorial, the color work wasn't too bad. Like I said, it was all about my need for bobbins. 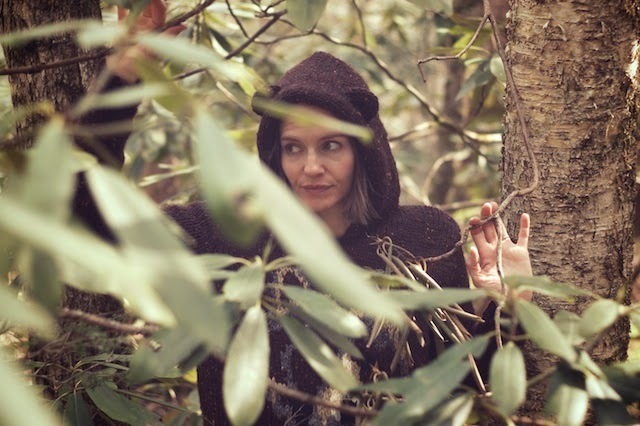 I only get to camp a few times a year, and only one trip outside of Texas, so I relish the woods and mountains and cold and animal life when I can. Next thing you know, you'll be camping and I'll be the jealous one. I'm so glad the cub was okay!! I hate hitting anything. If I see anything in the road I swerve like crazy and shriek. My kids roll their eyes, "It's okay Mama. The plastic grocery bag is still alive." And thanks. Colorwork animal heads are big fun. I want to try Andi Satterlund's Moose vest next. Thank you, Veronica! Horses on clothing was so big when I was little and then again, just a few years ago. That's a fun kind of heirloom for a grandma to make and for Chloe to remember her by! Thank you, Lori! I agree about short strands! I just didn't know what to expect and so had lots of little balls of yarn hanging from the back. Plus, I combined fair isle and intarsia for it, so it was a mess. Next time I try intarsia, I think I'll be more efficient. Thanks! See, I haven't heard her music yet, except for the Woodsy Assoc song. It's stuck in my head. I've even heard my son humming it and he didn't listen to it intentionally, lol. There are several things my daughter wants from the patterns in the book- Mr Fox and Rapunzel, I think. Maybe now that I've knit one, I'll be on a roll and knit some more. So many of them are small and would be good stash busters too.